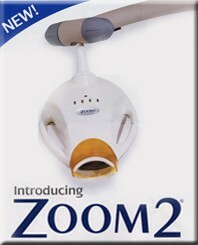 At our office, we use the latest and most advanced teeth whitening process available - the NEW Zoom! 2. Our Zoom! 2, In-Office Whitening System is a revolutionary tooth whitening procedure. In just over an hour, your teeth will be dramatically whiter. Zoom! is ideal for anyone looking for immediate results. The convenience of Zoom!2 in comparison to days of wearing trays for gradual at-home whitening makes it the perfect choice for the busy individual. The whitening procedure is simple and painless. It begins with a short preparation to isolate your lips and gums. The Dentist then applies the whitening gel, which is activated by the specially designed light. Teeth typically become at least six to eight shades whiter, sometimes more. A short fluoride treatment completes the procedure. You'll be amazed with the results. In most cases, teeth get even whiter the first few days after procedure. The light activated gel was developed after years of research. The gel is scientifically formulated, ph-balanced Hydrogen Peroxide that, when activated by the Zoom! light, gently penetrates the teeth to remove deep stains and discoloration. With proper care and an occasional touch-up at home, your whiter smile will sparkle for years. This system provides an alternative to costly and time-consuming trips to the dentist and/or other over the counter products that do not offer the same benefits as the Zoom!2 system.